400 pages | 247 Color Illus. The ability to thoroughly and properly document a crime scene through photography is a must for crime scene investigators. Regardless of the time of day, weather conditions, or confines in which a piece of evidence is concealed, photographs must be true and accurate. Capturing all the pertinent information and evidence for use during an investigation and testimony is critically important. Evidence is commonly found in less-than-photographically-friendly environments. Possessing the knowledge and skills necessary to properly photograph those difficult-to-image subjects is vitally important. Advanced Crime Scene Photography explains how to identify crime scene challenges, design plans to capture images correctly, and execute those plans successfully. Seamlessly integrating photography principles with corresponding applications in crime scene photography—moving progressively from basic to more advanced concepts—this book demonstrates how to record photographs in low-light conditions, including the use of flash and painting with light techniques. The book also addresses a variety of topics including impression evidence, fire scenes, laser trajectories, macro-photography, and ultraviolet and infrared photography. Anyone can take a photograph in perfect lighting, with the subject sitting out in the open and already positioned for the best composition. 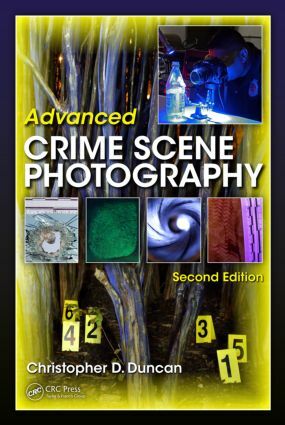 Advanced Crime Scene Photography, Second Edition provides crime scene investigators with a comprehensive, step-by-step resource on crime scene photography under the most difficult and adverse conditions. "… a well-written, comprehensive, and excellently detailed book on the practicalities of crime scene photography." Christopher D. Duncan is a senior police officer with the Identification Division, Crime Scene Unit of the Houston Police Department. He holds a BA from George Mason University and an MA from the University of Houston–Clear Lake; has more than 2,100 hours of training specific to the documentation, collection, and processing of physical evidence; and is a graduate of the National Forensic Academy. An IAI and IABPA member, he is an IAI board-certified senior crime scene analyst, bloodstain pattern analyst, and forensic photographer. He also instructs for the Texas Engineering Extension Service, a member of the Texas A&M University System.